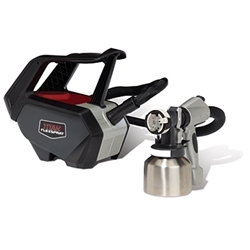 The FlexSpray™ puts the power of airless and the control of HVLP into one versatile sprayer creating the first multi-tool for painting professionals. FlexSpray's™ advanced technology was developed for professionals who spray a variety of coatings with multiple applications. Just pull the trigger and your Interior, Exterior or Fine Finishing project will finish with ease. The revolutionary Quick Change System allows you to change coatings and applications in a snap. It's as easy as 1,2,3 to change from the high production FlexFinish™ front end to the precise FineFinish™ front end. The FlexSpray™ put the power of airless and the control of HVLP into one versatile sprayer creating the first multi-tool for painting professionals. FlexSpray's™ advanced JetForce technology was developed for profressionals who spray a variety of coatings with multiple applications. Just pull the trigger and your Interior, Exterior or Fine Finishing project will finish with ease. - Variable speed engine turbine creates atomization power equal to a 4-stage HVLP and the speed equal to an airless using a 413 tip. - The Flexfinish nozzle delivers a unique combination of air and material. The patented FineFinish ™ Slot Nozzle gives the power to spray unthinned coatings like latex and enamel at high speed with little overspray. - The revolutionary Quick Change System allows you to change coatings and applications in a snap. It's as easy as 1, 2, 3 to change from the high production FlexFinish front end to the precise FineFinish front end. Click Here for Titan's Flexspray brochure. See the Flexspray in action!